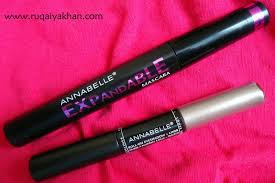 Today's post features two new eye products from Annabelle which are currently in stores and making a buzz everywhere. Yesterday, I was just getting ready for a regular day and felt like these two made it so much easier for me to do my eyes quickly, so here I am sharing these two with you guys. Lets move on to the pics, swatches and how it looks on my eyes. 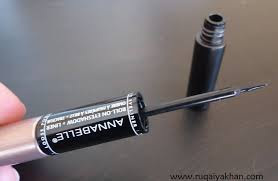 Lets start with the Annabelle Roll-on Eyeshadow + Liner, first, since the eyeshadow and liner go on before the mascara, in my case, at least :). This is a great idea, since it comes with two essential elements of any eye makeup, a shadow and liner. The shade I have is Brown. It comes in three more shades, Hazel, Green and Blue. You can pick the one that suits your eye color. 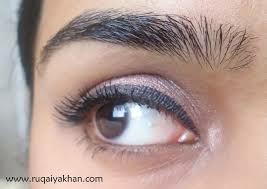 At one end, there is liquid liner and loose eyeshadow on the other. 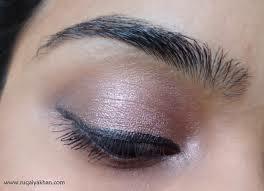 Since the eyeshadow comes with a roll-on its much easier to sweep over lids. As the shadow is a loose powder, I recommend using an eye primer so that the powder settles well on lids and of course it stays on longer with a primer. 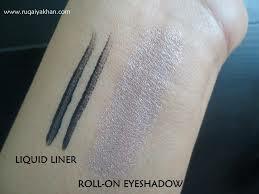 I expected a lot of fall out with the loose shadow but surprisingly the roll-on makes sure that enough is applied to lids so there is no wastage or the shadow falling on to cheeks. This mascara has a expandable brush that retracts to give length and definition and expands for volume. 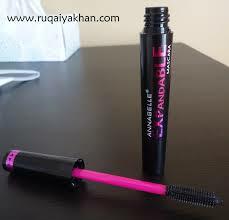 Its like having a lengthening and volumizing mascara in one. The design is pretty cool and I like the twist up dial at the cap and its somewhat fun to use something different like this. Here comes the best part of this review!! The swatches!! Picture shows two strokes of the liner. Its not insanely black but quite wearable on a daily basis. On the right, is the swatch of the shadow. Its a cool toned taupe. 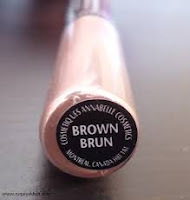 The little bit of brown on the crease and the darker outer V was created using Marcelle Kajal Kohl Liner and I also used Marcelle eyeshadow primer, as shown below. Shall review these in detail soon. I like how natural and full of life my lashes appear. 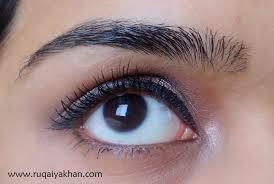 They look nicely curled up with just enough length and volume to accentuate my lashes. Love lash separation and totally no clump formula. Hope you enjoyed this review and please share what you think about these.. Besides ur nail art I am loving ur nail art <3 Lovely review as well.